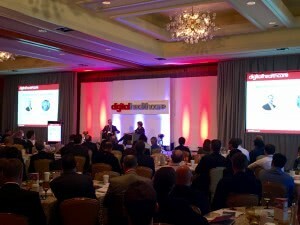 “We want fee for value all day long” was one of several opening statements made by Optum CEO Larry Renfro at the start of the Digital Healthcare Innovation Summit on Tuesday November 3 in Boston. This statement underscored a theme that permeated the majority of the day’s conversation, led by executives at some 60+ emerging and established digital health companies. Panelists addressed the mobile workforce, security challenges in health tech, population health management, the advent of telemedicine, and above all, the challenge of delivering effective care tools that will engage consumers and clinicians while also providing a cost incentive for industry support. Optum CEO Larry Renfro talked about how the health services platform and subsidiary of UnitedHealth Group is looking to more effectively reach consumers. Renfro said that Optum doesn’t yet have a “front door” for consumers, something the company is working to develop. He sees digital health tools and analytics as a way to better assess and manage the millions of consumers Optum touches daily – starting with the 66 million prescriptions the company transmits on behalf of consumers each day. Mobileron VP Ojas Rege noted that for the first time last month, more than half of internet activity was accessed over mobile. 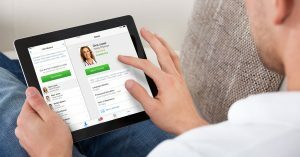 Reje added that 80 percent of people are likely to choose convenience over security when communicating on mobile – proving a great challenge for healthcare innovators as they look to create streamlined, intuitive mobile experiences that are also HIPAA-compliant and secure. Rege advised companies developing a mobile experience to adopt a mobile-first strategy when establishing their security infrastructure. 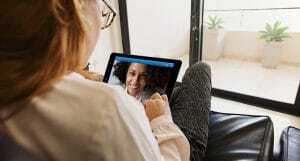 American Well Chief Medical Officer Dr. Peter Antall discussed the future of telehealth as a tool to manage chronic care since it empowers doctors to use telehealth visits to treat patients with chronic conditions remotely. Antall also gave an example of in-hospital telehealth usage that would allow a doctor who just met with a patient having a mental health crisis to immediately refer that patient to a psychotherapist for a live video visit. 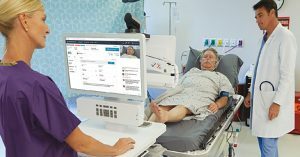 This would eliminate the wait for a follow-up appointment – which can often take a month to schedule – and reduce the risk to the patient who is suffering. Evolent COO Tom Peterson addressed the need for the industry to better integrate care encounter data – such as benefit and network information – into mobile health technologies, for effective real-time population health management. Without that data readily available, the industry risks disrupting the consumer experience, or worse, sub-par care delivery. athenahealth CEO Jonathan Bush addressed the futuristic ideas of an “internet for healthcare” that would serve as a marketplace for consumers to shop for healthcare goods and services, in the way that Amazon.com exists today for things like pillows. Bush added that due to the millions of patient records and providers currently on their platform, the company is by default building a “cloud system for the hospital” – but that they don’t want to “go it alone.” Clearly the opportunity is ripe for continued collaboration in healthcare. Throughout the panels, different leaders discussed the trend towards consolidation in healthcare and compared recent, pending health insurer mergers with the rise of health insurer startups (Oscar, Zoom). Remedy Partners Chairman and CEO Steve Wiggins said that he’s “concerned about consolidation” and advocated for continued entrepreneurship and new business formation. He added that, particularly in healthcare, entrepreneurs often must “wait for the markets to catch up” – something we have witnessed first-hand here at American Well, given the rapid adoption of telehealth in just the last couple years. There were so many exciting topics discussed at Digital Healthcare Innovation Summit that it’s difficult to capture all of it in one summary. If you attended, what were your key highlights? Any topics left off the table?